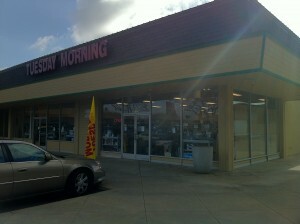 Discount retailer Tuesday Morning is to close their store at Winchester and Payne on December 31. All items are marked down 50% to 80%. 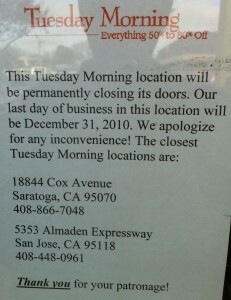 A flyer announces the closing of the store. This entry was posted on Tuesday, December 28th, 2010 at 12:21 pm by John Vink	and is filed under Uncategorized. You can follow any responses to this entry through the RSS 2.0 feed. You can leave a response, or trackback from your own site.